Help a member of the Circle give up their beasthood. Agree to help them purify themselves. Collect a Glenmoril witch head and travel to Ysgramor's Tomb. Fight the wolf spirit of Farkas or Vilkas. When you speak to either Farkas or Vilkas about work, the response may be a bit out of the ordinary. Each has something weighing on them, a personal matter. Play the good therapist here and ask what the trouble is. They will reveal that they have been pondering Kodlak's choice in the Glory of the Dead quest and want to follow suit: to be cured of lycanthropy. If you have a Glenmoril witch head in your inventory from your previous adventures in the Blood's Honor quest, the brother will urge you on to Ysgramor's Tomb. If you do not have one, the Companion is eager to procure one. Travel to Glenmoril Coven to take a head. There are five Glenmoril witches laid up in the coven. Depending on how many heads you gathered in the previous visit to the coven, harvest what you need. If you did not cure yourself of lycanthropy in the previous quest and wish to be removed of it now, harvest a head for yourself as well. However, you will need to finish the quest by curing the active follower, before you can cure yourself. When you have one of the heads, return to Ysgramor's tomb. As you did for Kodlak in Glory of the Dead, activate the Flame of the Harbinger by tossing in the head. This will release the wolf spirit of the brother wanting to be cured. You must destroy the wolf spirit in order for him to be purged of his wolfish ways. 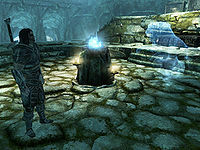 When the spirit is destroyed, Vilkas or Farkas will describe a soothing sensation and a clear mind and thank you for your help with a leveled amount of gold. On agreeing to rid Vilkas of his lycanthropy, he will follow you out of Jorrvaskr. The quest marker will appear on Ysgramor's Tomb but disappear after a few seconds. Vilkas will stop following you but the game will act as though he still is, which results in your not being able to take another follower or complete the quest. Have two witch's heads in your inventory and save the game before you hand over each Companion mission. When you ask for a new job and Vilkas asks you to cure him, reload your last save and ask Vilkas to join you. Inside Ysgramor's Tomb, part ways with Vilkas and then speak to him again to tell him you've finished the last mission. Ask him for more work and accept to cure his lycanthropy. He will then follow you to the font where you can throw in the witch's head and fight his wolf spirit. The game then asks you to talk to Vilkas, but you cannot. You can, however, purify yourself once this has happened by throwing another witch's head into the font and fighting your own wolf spirit. Be aware that the game still thinks Vilkas is a follower, so you will be unable to have a genuine follower once you have done this. Speak to Vilkas first. If he does not immediately asked to be cured, take his radiant quest then speak to him with the witch's head in your inventory. He should then ask - however you should not take it. Refuse him, and instead check to see if Farkas is offering any work. If Farkas is now offering work but only a random/radiant quest, take it and then speak to him again (once completed) with the head in your inventory. He should now ask you to help him rid his lycanthropy. Help him (Farkas) first, and then go back and help Vilkas with his personal request. If Farkas still will not offer any work, purity quest nor radiant quest, go and speak with Aela and do a quest for her. This will unlock Farkas' quests. Alternatively, wait until Vilkas offers the cue dialogue of "Is there any work to be done? ", but immediately close the dialogue box. Fast-travel to anywhere, then come back. Farkas should now offer the cue dialogue, and you can perform the quest with him. Repeat with Vilkas. Do the purity quest with Farkas first. After this is done, when you return to Vilkas, do a regular quest and then pick the purity quest again. Vilkas will now follow you without a glitch. Take Vilkas to Ysgramor's Tomb as described, split ways, report the success of the last errand, and agree to help Vilkas with his wolf spirit. Instead of activating the Flame Of The Harbinger, enter quest stage 100 by using the console command setstage CR13 100. Vilkas is now cured. Repeat with Farkas, but this time, activate the Flame. Complete a couple of random requests from Farkas and Aela, then get the Dragon Seekers quest from Vilkas. Slay the dragon with Farkas and this will resolve the follower issue. To fix the bug, talk to Vilkas to get a regular quest. Complete the regular "looking for work" quest, then go speak to Farkas. He should now ask for help curing his lycanthropy. You should now be able to complete the quest normally. To fix the bug alternatively, If you have the Dawnguard add-on, then complete a basic task for Vilkas and then talk to Aela. Complete tasks for her until she gives you a quest to find one of three Werewolf Totems. Aela will then accompany you on the quest for them, replacing your "invisible follower". This then allows you to complete the "Purity" quest for Farkas first, then Vilkas. 10 <Alias=Questgiver> wants to be cured of lycanthropy, and has asked me to help him. We must take a Glenmoril Witch's head to the Tomb of Ysgramor to perform the same ceremony which cured Kodlak. 15 <Alias=Questgiver> wants to be cured of lycanthropy, and has asked me to help him. We must take a Glenmoril Witch's head to the Tomb of Ysgramor to perform the same ceremony which cured Kodlak. 100 Finishes quest I helped <Alias=Questgiver> cure himself of lycanthropy. On the PC, it is possible to use the console to advance through the quest by entering setstage CR13 stage, where stage is the number of the stage you wish to complete. It is not possible to un-complete (i.e. go back) quest stages, but it is possible to clear all stages of the quest using resetquest CR13. This page was last modified on 2 July 2018, at 19:15.